The dictionary definition of opportunity cost is ‘the loss of other alternatives when one alternative is chosen’. When it comes to buying property, the ‘alternative’ chosen is usually to do nothing and wait. This is happening right now as many people think they can time the market. It’s human nature to follow the herd. Following what everyone else is doing gives you a sense of comfort, doesn’t it? I have personally invested in residential property for over 25 years, and I have been in the finance game even longer, and I can tell you with confidence that following the herd will destroy your long term wealth. The only thing that could kill Superman was kryptonite, and when it comes to creating wealth, opportunity cost is like kryptonite… it will destroy your long term wealth. Our property markets are currently taking a breather (which is normal) after running hard for a number of years, recording strong capital gains particularly in major capital cities like Melbourne and Sydney. Every investment goes through a cycle, and property is no different. The issue is that every time the property market goes through this (normal) phase of the cycle (a downturn), the media goes to town with sensationalism which creates fear. At the moment, fear is feeding fear like a frenzy, and this is causing many people to do nothing and wait. My question is, wait for what? If you have the borrowing capacity and affordability to upgrade your home, upgrade to your preferred location, invest in a property, or buy your next investment property, then what are you waiting for? If you play the long game, then time in the market trumps timing the market any day. If you are looking for a quick dollar, then play the casino as it’s just as risky with lesser hassle. Those that try to time the market seldom get it right. No one rings the bell when the market is right at the bottom or right at the top. People ask me what’s likely to happen to our property market(s) over the next 12 months. My answer is usually “I don’t know and it doesn’t matter”. Why? Because I play the long game and my focus is on where property prices will be in the next 10, 20, 30 years… or even longer. If you play the long game, you have a pretty good chance of creating significant wealth through the power of residential property. Timing the market is risky. As you can see in the graph below, Melbourne’s median house price increased from ~$380k in 2006 to ~$720k 10 years later. During that decade, we had the GFC, acts of terrorism, the naysayers that predicted prices slumping by up to 50%, and so on. 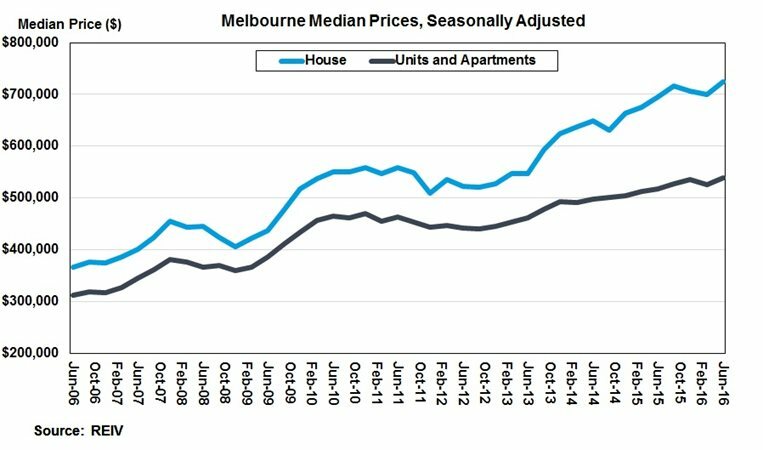 As the graph illustrates, we had ups and downs (which is normal) but over the long term the median house price almost doubled. I’m sure you’ve heard the infamous quote from Warren Buffet (the worlds most successful investor of our time)…“be fearful when others are greedy and greedy when others are fearful”. Here’s a strong hint, the time to be greedy is right now..! !